The chatter since the KREIT debacle was that the management structure of Singapore Real Estate Investment Trust (REIT) are under close scrutiny. Are they working for themselves or working for you the shareholder? For those interested in investing in REITs they may want to pick up a copy of The Edge ($3.00) whose cover story is on this issue. There are quite a few articles on Food Empire, Olam and MRO companies like ST Engineering and SIA Engineering. 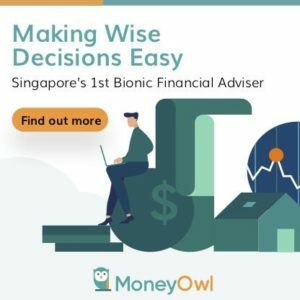 A Standard Chartered Report pointed out that most REITs in Singapore are trading at discounts to their net asset values, and sport yields that are exceptionally high, reflecting broad concerns with the way they are managed. I hope I am reading the table right because it seems that K-REIT Asia,Frasers Commercial Trust and Suntec REIT have huge management fee as % of their net income. I hope its not distorted. To follow the dividend yield changes daily as well as the valuation changes, you can follow my Dividend Stock Tracker which is updated daily. Hi, thanks for sharing this article. 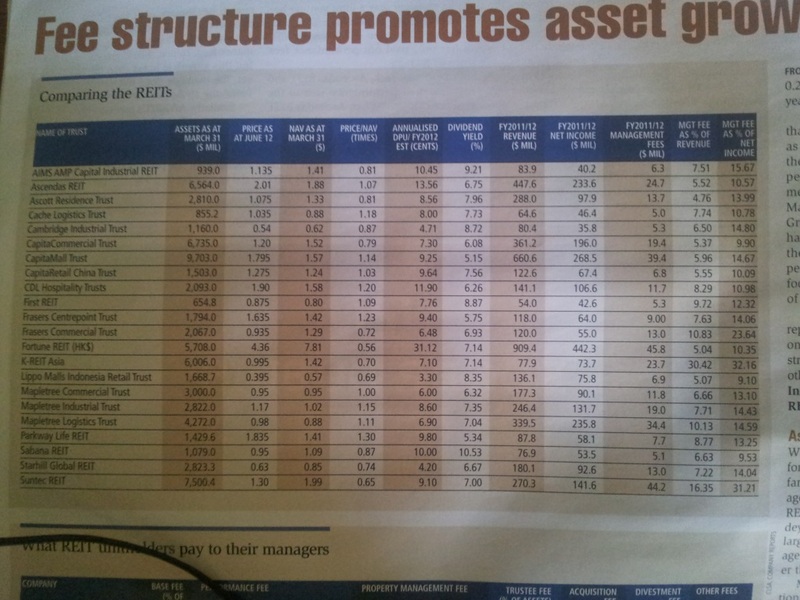 Do you mind sharing the subsequent data table ‘What REIT unitholders pay to their managers’ too? Thanks! The management fee as % of Revenue differs significantly from % of Net Income. 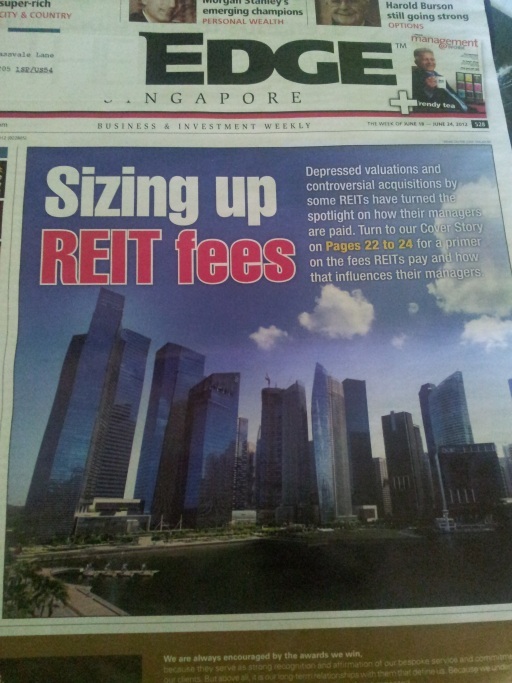 Could it be caused by gearing of the REIT, thus increasing the interest payments? On a side note, KREIT management fee is really expensive, management fee as % of revenue and net income are both 30%! i suspect that perhaps it is due to the earnings only reflecting part of income. but if they are not earning those income then they shouldnt be earning those nominal fees. or they are just expensive.